What Will Lead to Precise Interventions for GBM Patients? Glioblastoma multiforme (GBM) is the most prevalent and lethal type of human primary brain tumors. Patients with GBM have a median survival of only 16 months and their two-year survival rate is 30% in spite of treatments. Over past decades, significant advances have been made in studying and diagnosing GBM. However, underlying mechanisms of this fatal GBM tumorigenesis in human remain largely elusive. Glioblastoma stem cells (GSCs), which represent a rare cell population that are resistant to conventional radio- or chemo-therapy, are more and more recognized as the tumorigenic component of GBM. Presumably, GSCs are also responsible for cancer relapse. 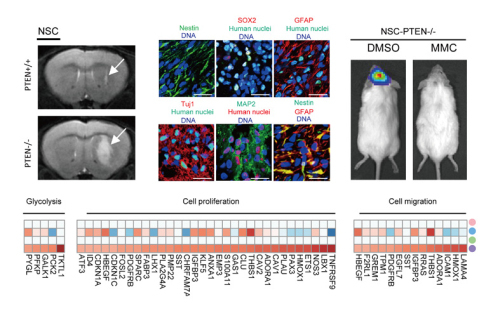 Evidence from tumor models in mice suggests that neural precursor/stem cells are the cell-of-origin of GBM, which are speculated to be derived from transformed neural stem cells (NSCs). However, this hypothesis has never been directly attested in human due to the lack of an adequate human cellular model. PTEN, a well-known tumor suppressor, is broadly associated with cancer risk and genetic susceptibility. PTEN mutations are observed in 60% of GBMs and represent the single most frequent genetic alteration in the disease. GBMs bearing PTEN loss of function mutations often highly correlate with increased invasiveness and drug resistance. In a new study published in Nature Communications, entitled PETN Deficiency Reprogrammes Human Neural Stem Cells Towards a Glioblastoma Stem Cell-like Phenotype, researchers from both Chinese Academy of Sciences and Peking University generated a novel model of PTEN knock-out human NSCs. In this study, those cells offer the first “proof-of-concept” platform to study the role of PTEN in human NSC transformation. Meanwhile, the model allows further investigation in basic pathogenesis of GBM and may provide an ideal platform for screening drugs that specifically targeting GBM with “PTEN mutations”. 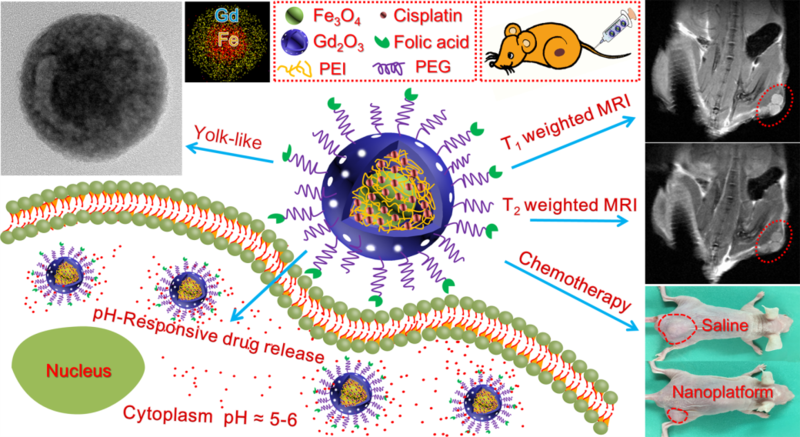 By using this novel human genetic model, the researchers found that NSC is a very susceptible cell type sensing PTEN-deficiency-induced tumor initiation. PTEN knock-out human NSCs showed uncontrolled proliferation, migration, metabolic changes, as well as malignancy-associated transcriptional and epigenetic alterations. In human mesenchymal stem cells (MSCs), however, PTEN-deficiency failed to induce neoplastic features. In contrast, PTEN-deficiency in MSCs resulted in cellular and molecular phenotypes typical of cellular senescence. In addition, the researchers demonstrated that PTEN associates with CREB/CBP at the Pax7 promoter, and mediates transcriptional repression of Pax7, which is a key gene involved in neural progenitor commitment and increased aggressiveness in cancer. The overexpression of Pax7 in NSCs may account for the undifferentiated histology of GBM, a common feature of more aggressive cancers. Searching in large clinical database, researchers also found increased Pax7 level in PTEN-deficient glioblastoma. By taking advantage of the advancing gene editing technology, the researchers examine “one mutation” at a time in human ESC-derived NSCs with clear genetic background, and by utilizing this simplified genetic model, they further screened drugs targeting this specific mutation and identified that mitomycin C selectively triggers apoptosis in NSCs with PTEN-deficiency. The discovery of the novel mechanism in how PTEN safeguards NSCs and the establishment of a cellular platform to identify factors involved in NSC transformation may lead to the development of personalized treatment of GBM. This work was supported by National Basic Research Program of China (973 Program), the Strategic Priority Research Program of the Chinese Academy of Sciences, Beijing Natural Science Foundation, National High Technology Research and Development Program of China, National Natural Science Foundation of China, Program of Beijing Municipal Science and Technology Commission, Key Research Program of the Chinese Academy of Sciences, the Thousand Young Talents program of China, and China Postdoctoral Science Foundation Grant. Figure 1. Targeted disruption of PTEN leads to neoplastic transformation of human NSCs and Mitomycin C selectively triggers apoptosis in NSCs with PTEN deficiency (Image by Duan et al).